Greenland's Earthquakes: A Warming Planet's New Worry? Climate change has caused accelerated calving and melting of tidal glaciers around the world, resulting in a sea-level rise. But that’s not the only consequence: when large chunks of ice break off of a glacier and forcefully splash into the icy water, thunderous shaking often accompanies such events. These mysterious “glacial earthquakes,” which are detectable across the Earth, have been poorly understood—up until now. According to a new study published in the journal Science, a team of researchers from the United Kingdom and the U.S. believe they’ve discovered the source of the major seismic activity occurring around Greenland: the massive icebergs that are calving off the nation’s ice sheet are colliding back against it, causing the glaciers to rapidly move backward and downward. This backward movement—and the subsequent change in water pressure—cause glacial earthquakes, which can trigger massive tsunami waves that push water back up the fjord that leads to the glacier. In the past two decades, glacial earthquakes have increased sevenfold and have been migrating north, suggesting an increase in a loss of mass from the Greenland Ice Sheet through calving. It’s hoped that this new insight into glacier behavior will enable scientists to improve the reliability of models that predict future sea-level rise in a warming climate. Together, the Antarctic and Greenland Ice Sheets hold about 99 percent of the world’s freshwater ice. If it melted completely, the Greenland Ice Sheet (656,000 square miles) alone could raise the sea level by 20 feet. 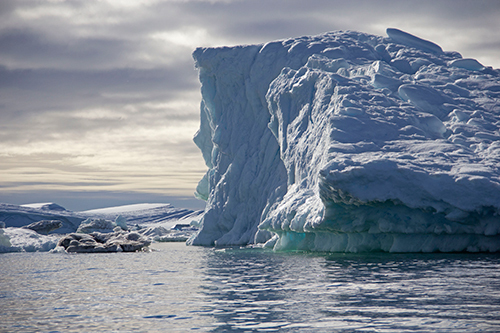 If the Antarctic Ice Sheet (5.4 million square miles) melted completely, it could raise it 200 feet. Fortunately for us, it’s predicted that such events would take thousands of years. Unfortunately, both sheets are currently melting at an unprecedented rate. The international team of scientists that conducted the new study suspected that glacial earthquakes were linked to calving events, but there was little data to support that theory. So they placed a wireless network of GPS sensors around the calving margin of the fast-moving Helheim Glacier, a major outlet of the Greenland Ice Sheet, located in the southeast across the Denmark Strait from Iceland. At 3.7 miles wide and more than 124.3 miles long, the Helheim Glacier flows as fast as 98 feet a day. 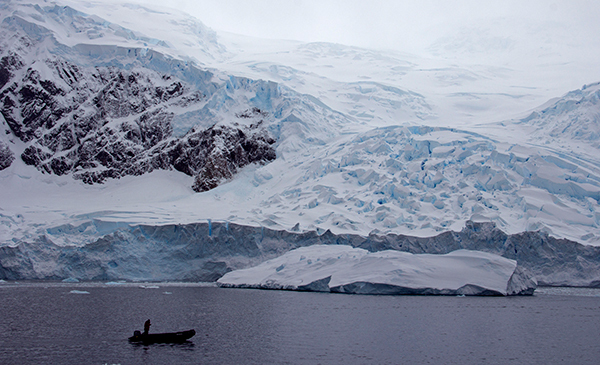 Calving icebergs from this glacier have been measured at up to 2.5 miles across. The scientists monitored the GPS network they set up for 55 days, from July to September 2013. They recorded 10 large calving events, all of which coincided with glacial earthquakes, some of which registered a magnitude of 5.0. 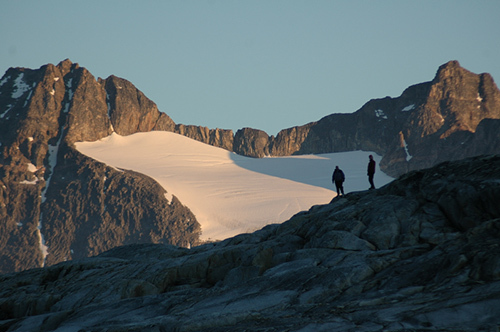 Following the earthquakes, the Helheim Glacier retreated by about one mile. And Helheim is just one of many Greenland glaciers that are losing ice. The researchers concluded that while the earthquakes themselves are not destabilizing the ice sheet, they indicate that it is getting smaller and retreating. Calving icebergs—which are responsible for roughly half the ice mass being lost from Greenland—are unpredictable and sporadic, so recording them in action isn’t easy. 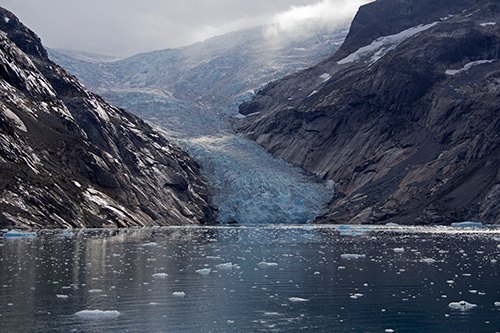 But by using quake detectors, scientists would be able to keep better, near-real-time track of how much calving ice is being lost from glaciers around the world, a crucial step toward understanding their contribution to sea-level change. Experts have warned that current greenhouse gas emissions will cause the planet to warm between two and four degrees Fahrenheit by 2100. Glacial earthquakes are likely to increase in frequency because calving rates rise when water temperatures and air temperatures rise. Each gigaton-sized (one billion tons) iceberg would be equivalent to roughly a quarter of a percent of Greenland’s estimated 378-gigaton annual ice loss. Yet it takes only 360 gigatons to raise the global sea level by a millimeter (0.03 inches), so Greenland is roughly doing that annually. Antarctica is contributing its share, as well. Between 2009 and 2012, just three Antarctic glaciers shed 204 gigatons per year, shifting the weight of the continent enough to slightly alter the Earth’s gravity. Taken together with a recent NASA study that showed that the West Antarctic Ice Sheet might completely disappear in the next few years, the increased rate of Greenland calvings could have a substantial impact on sea-level rise by the end of this century. By 2100, the economic damage due to climate change factors could total $1.1 trillion. A report from the Union of Concerned Scientists warned that by as early as 2030, rising tides will likely cause 24 floods per year for several communities along the U.S. East Coast. It’s sometimes easy to think that what happens at our poles—places such as Greenland and Antarctica—won’t affect us. But it does. The proof could come a short 15 years from now. Thank you, Nicole. It’s mind-boggling, what we still have to discover and learn. —C.G.A.